The Amphibian Ark helps to coordinate ex situ programs implemented by partners around the world, with the first emphasis on programs within the range countries of the species, and with a constant attention to our obligation to couple ex situ conservation measures with necessary efforts to protect or restore species in their natural habitats. An important aspect of helping to implementation amphibian conservation programs is to lead development and implementation of training programs for building capacity of individuals and institutions. A list of the subjects that would normally be covered during an Amphibian Ark husbandry workshop can be found on our Husbandry Workshop Topics page. You can also read more about our Husbandry Training Workshops or download the AArk Training Course Prospectus. An ex situ training course was held in Gamboa, Panama, April 1-6 to help facilitate professionals in Latin America to engage in properly planned, implemented and maintained ex situ amphibian programs through comprehensive training of key stakeholders and to further stimulate in-country, regional and international partnerships that will support successful captive programs. The workshop was held at the Smithsonian Tropical Research Institute facilities at Gamboa where there are excellent classroom and lab practical facilities. Utilizing twenty lectures and sixteen interactive sessions, the five-day training focused on four important aspects of captive population management: husbandry, hygiene, health and heredity; subjects crucial to protecting species within range country. In addition, local and regional aspects of amphibian conservation were covered along with ex situ planning aspects. Initiating the course was a group session where students shared their current experiences in the field amongst their peers, facilitating further discussions and possible collaborations through the duration of the course and beyond. This workshop brought together twenty-seven students from six countries in Latin America to share their experiences among each other and to learn what it really means to save amphibian species. The workshop was made possible with the financial and logistical support of USAID, Smithsonian Tropical Research Institute, Amphibian Ark and the Panama Amphibian Rescue and Conservation Project. Staff from Amphibian Ark and the Toledo Zoo executed the first Amphibian Academy Course at the Toledo Zoo in April. This new course was designed to provide a broad perspective training opportunity for people working in the field of amphibian conservation. These “practitioners” go beyond the zoological community. In fact, of over twenty-five applicants, only a small percentage were from zoos. Most applicants were from university or private settings. The course size was small, limited to sixteen students and the selection process was careful to take into account how these students will put their new knowledge to work in their own programs and careers. Students came from as far as India, Hong Kong and Madagascar but as close as Canada and Michigan. 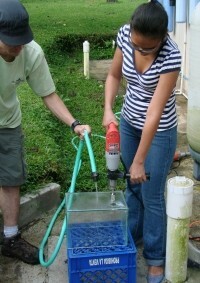 The course included lectures, hands-on practical exercises, and fieldwork. Students were provided with plenty of opportunities for personal mentoring to address their specific interests and needs by globally-recognized and successful amphibian conservationists. The hands-on activities were allotted more time and allowed students to learn by doing in small groups with team instructors, and thus providing better opportunities to learn. Overall, the small class size allowed for much more emphasis on the individual student and addressing their specific needs relating to amphibian conservation work. This was achieved through the many group discussions throughout the week where students were not only talking about the specifics of husbandry or veterinary care, but taking on more complex topics of ex situ planning and program management. They learned that it not always about “how” we do something but in some cases, “why?” The Pioneer Boy Scout Camp provided us great opportunities for covering field techniques and helped to connect the in and ex situ aspects of amphibian conservation. The students learned survey techniques and had training in frog call survey work while at the camp. The faculty for the course included true leaders in their fields of expertise of amphibian research, conservation, and husbandry. They will remain available to the students in the future as mentors and professional contacts. We are especially grateful for the logistical support and assistance of all the Toledo Zoo staff who worked hard to make things run smoothly. We are also indebted to the generosity of Dr. George Rabb and Zoo Med (www.zoomed.com) for supporting the training of up-and-coming amphibian conservationists. Why is Latin America important in terms of amphibian conservation? This region contains the richest amphibian diversity on the planet. Many of these species are critically endangered. Building capacity across the region to safeguard threatened amphibian species in range country is a mandate for Amphibian Ark and it was decided to hold an ex situ training course in Gamboa, Panama. This workshop was engineered to help facilitate professionals in Latin America to engage in properly planned, implemented and maintained ex situ amphibian programs through comprehensive training of key stakeholders and to further stimulate in-country, regional and international partnerships that will support successful ex situ programs. 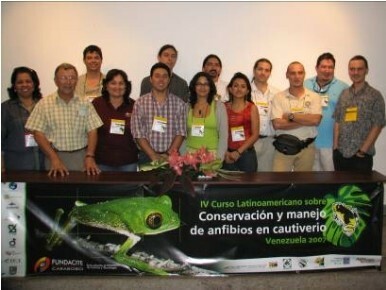 This workshop was aimed at range country personnel in Latin America who are directly working with amphibians in captivity or planning to do so in the near future. We had participants from Chile, Colombia, Ecuador, Guatemala, Mexico, and Panama. Staff of the Panama Amphibian Rescue and Conservation Project (PARC) also attended which is important and timely in light of the amphibian facilities being developed at Gamboa. The workshop was held at the Smithsonian Tropical Research Institute facilities at Gamboa where there are excellent classroom and lab practical facilities. Utilizing 20 lectures and 16 interactive sessions, the five-day training focused on four important aspects of ex situ population management: husbandry, hygiene, health and heredity; subjects crucial to protecting species within range country. In addition, local and regional aspects of amphibian conservation were covered along with ex situ planning aspects. Initiating the course was a group session where students shared their current experiences in the field amongst their peers, facilitating further discussions and possible collaborations through the duration of the course and beyond. The course utilized working groups where the students participated in planning conservation programs including facilities, enclosures and educational outputs. The comprehensive plans were presented as the end of the workshop. Groups were selected to maximize the interaction of participants from different regions and minimize the potential impact of local professional relationships, familiar students and other bias. The concept here was to promote student interaction and discussion allowing students to learn from each other as well as the instructors. This workshop was made possible with the financial and logistical support of USAID, Smithsonian Tropical Research Institute, Amphibian Ark and the Panama Amphibian Rescue and Conservation Project. 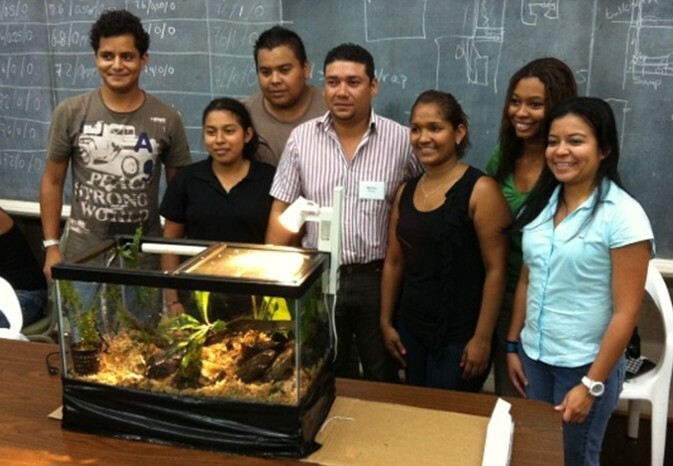 This workshop was held at the Dominican Republic National Zoo (ZooDom) in Santo Domingo, where there are excellent classroom and lab practical facilities. This was a central location for participants from many places in the region and thus there were students from Cuba, Puerto Rico, Trinidad and Tobago, Dominica, Mexico and the Dominican Republic. Staff of ZooDom and also of Barrick Pueblo Viejo Dominicana Corporation attended the workshop, which is important and timely in light of the amphibian facilities being developed at their institutions. 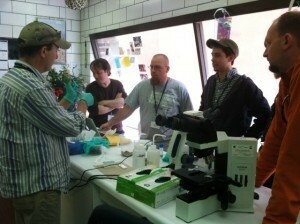 Local scientists from the Natural History Museum and Aquarium were also in attendance. Students were provided with course materials which were distributed electronically before the course. These included reading materials on the forthcoming subjects, participant lists and a pre-course quiz that students were required to return prior to the workshop. Utilizing fifteen lectures and eight interactive sessions, the five-day training focused on four important aspects of ex situ population management: husbandry, hygiene, health and heredity; subjects crucial to protecting species within range country. In addition, local and regional aspects of amphibian conservation were covered along with ex situ planning aspects. At the beginning of the course was a group session where students shared their current experiences in the field amongst their peers, facilitating further discussions and possible collaborations through the duration of the course and beyond. The course utilized working groups where the students participated in planning conservation programs including facilities, enclosures and educational outputs. The comprehensive plans were presented at the end of the workshop. Groups were selected to maximize the interaction of participants from different regions and minimize the potential impact of local professional relationships, familiar students and other biases. The concept here was to promote student interaction and discussion, allowing students to learn from each other as well as from the instructors. This workshop brought together fifty-two students from seven countries in the Caribbean region to share their experiences among each other and to learn what it really means to save amphibian species. At the end of the course, groups presented their work. Included were natural history of the species, conservation needs, specific role for the particular group. This was followed by information on facility and enclosure design (with attention to biosecurity and quarantine as needed) along with plans for educational materials, which ranged from graphic panels to brochures and posters. The Singapore Zoo is one of the most advanced and successful zoos in South-East Asia, combining zoological exhibits, excellent horticulture and a very strong conservation education message. The Night Safari, Jurong Bird Park and Zoo combine to make a real destination for visitors within the region and outside. Currently, the zoo maintains several species of amphibians in the Fragile Forest exhibit, a large walk-through forest that is home to other vertebrates such as fruit bats, lemurs and numerous birds. Several amphibian species from the region are showcased in the entrance of the Fragile Forest including Malaysian Horned Frog, Megophrys nasuta, Giant River Toads, Bufo asper, and Blyth’s River Frog, Limnonectes blythii. The new River Safari park due to open in June 2012 will also display amphibians when the time comes. Recognizing the need to go beyond displaying animals but to also work to contributing to their conservation in nature, the Singapore Zoo intends to expand its conservation efforts in the future. Our workshop served as a foundation for new and existing zoo staff to stand on in terms of getting an understanding of the needs of amphibians in captivity. Over the course of three very intensive days, we combined interactive discussions, lectures and hands-on practical sessions covering topics from basic husbandry, light and water quality, to exhibit design. Amphibian Ark consulting veterinarian and instructor Brad Wilson covered all of the health, nutrition and disease aspects in both lecture and demonstration form. Group projects helped to stimulate independent thinking and exchange of ideas as students were given conservation initiatives to develop on their own. A big thanks for AArk Taxon Officer Kevin Johnson who stayed on after the Amphibian Conservation Needs Assessment workshop to help with training logistics and support. Fortunately for all (instructors included), Dr. Phil Bishop, recently appointed Scientific Advisor with the Amphibian Survival Alliance was along as an observer. Phil was extremely helpful in adding information from his own husbandry experience and also in bringing the big picture of amphibian conservation goals into the mix. Students left the course with not only a better idea on what is involved to properly maintain amphibians in captivity but also a grasp on “why” we are doing this in the first place. 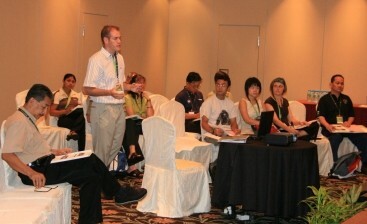 The next steps will be to assist local stakeholders in Singapore to pursue and plan meaningful conservation projects. Taman Safari Indonesia in Cisarua, Bogor provided an expansive and beautiful venue for the Amphibian Ark husbandry workshop held from March 9-11, 2010. Twenty-five students attended from West Java and also neighboring Sumatra, all keen to learn more about amphibian husbandry and conservation. The instructor team consisted of Ron Gagliardo, Andy Odum (Toledo Zoo), Mike Ready (Sandfire Dragon Ranch) and Michael McFadden (Taronga Zoo, Australia). The course covered topics ranging from basic husbandry and water quality to captive reproduction and veterinary care. In addition, ex situ planning and exemplary programs were covered to help students gain a full appreciation of how these programs are initiated and carried out. Hands-on group projects and demonstrations were held outdoors which despite the rain, was not a problem as Taman Safari Indonesia staff erected a massive canopy for us within minutes! For more up-close and personal interactions with amphibians, the group was divided into teams for a night hike to explore for frogs in the national forest surrounding the park. Over a dozen different taxa were encountered including Megophrys, Rhacophorus and Bufo. A great deal of gratitude is owed to the in-country organizers: Dr. Mirza Kusrini (Bogor Agricultural University) and staff at Taman Safari: Mr. Jansen Manansang, (Director, Taman Safari), Sharmy Amy Prastiti, Retno Sudarwati, and Bongot H. Sirajaguguk. Following hot-on-the heels of the Sri Lankan Amphibian Conservation Needs Assessment workshop, Jamie Copsey and Gerardo Garcia from Durrell Wildlife led a week-long Amphibian Conservation Husbandry course in Kandy, Sri Lanka in November. 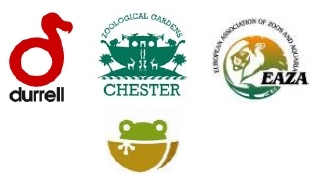 Chester Zoo contributed Richard Gibson’s time to this course also, making a trio of dedicated tutors to deliver a comprehensive and complex series of lectures, discussions sessions, and practical workshops. Further lectures by Sri Lankan contributors gave the course a tailor-made, Sri Lankan focus and a mid-course field trip to the extraordinary Knuckles mountains provided the twenty-plus, trainees and trainers with both a well-earned break from the intensity of the classroom and an opportunity to see some wild reptiles and frogs – including the Critically Endangered Nannophrys marmorata. Results from the preceding Conservation Needs Assessment workshop were discussed in the husbandry workshop also and a selection of species recommended for ex situ educational or ex situ research work were used as focus species for applying what was being taught in each module of the course. Detailed enclosure designs and husbandry methodology were therefore drafted during the course and can provide a ‘kick-start’ to programs for the species in the future. All course participants were awarded a certificate at the end of the course and provided with a DVD containing more than 450 megabytes of course lectures, presentations, references and other materials relevant to the conservation of amphibians in situ and ex situ. A small grant fund was also established by Durrell and Chester Zoo to which course graduates can apply for seed-funding to initiate new, or further existing, amphibian conservation projects – a means to keep up momentum and allow new knowledge, ideas, enthusiasm and partnerships to be acted on swiftly. 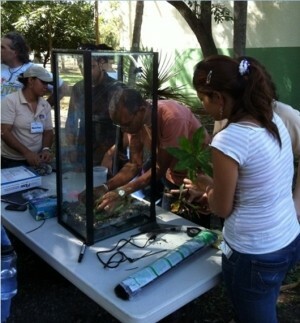 Amphibian Ark staff and colleagues conducted a three-day intensive husbandry training course in Panama October 23-25. Led by training officer Ron Gagliardo, this course aimed to put experience and knowledge into the hands of ten students, some of whom will soon be directly involved in caring for amphibian assurance populations at the Panama Amphibian Rescue and Conservation Project Facility being put together at the Summit Zoo near Panama City. The agenda covered specific husbandry techniques, captive reproduction and climate control but also had special focus on veterinary care, health and nutrition and food colonies. The course was set up in El Valle in close proximity to the El Valle Amphibian Conservation Center (EVACC) and their team of Edgardo Griffith and Heidi Ross, directors. Hands-on work has been undertaken at this facility which currently houses dozens of species (and hundreds of individuals) of threatened amphibians of Panama. In addition to Ron Gagliardo, the instructor team consisted of Allan Pessier (San Diego Zoo), Robert Hill (Atlanta Botanical Garden), Brad Wilson (Veterinary Clinic West, Atlanta), and Joe Mendelson (Zoo Atlanta). This diverse group were able not only to cover many topics in their own areas of expertise but to interact with students, providing valuable advice and information. We gratefully acknowledge the funding assistance from the Smithsonian Institute, Amphibian Ark and instructors who covered some of their own expenses to be able to participate. 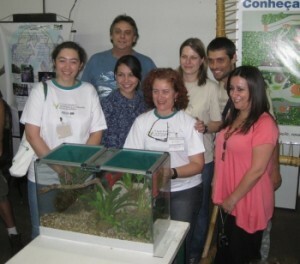 Hosted by the Sociedade de Zoológicos do Brasil (SZB) and Zoo Bauru, the first AArk Amphibian Husbandry Workshop in Brazil was held from September 13-19 in Bauru, Brazil. With over thirty students in attendance from a variety of backgrounds (zoos, universities, NGOs and government), Ron Gagliardo and Kevin Zippel from the Amphibian Ark and Andy Odum from Toledo Zoo, and also co-administrator of the AZA Amphibian Biology, Conservation and Management Course, led presentations on many husbandry topics and also hands-on demonstrations and group projects. We were happy to see many Brazilians connected for the first time, finding out how much each are doing in their country, home to over 800 species of amphibians! The course was organized and coordinated by Catia Dejuste de Paula, Luiz Pires (President SZB), Ralph Vanstreels, and Juliana Lehn Linardi. We owe a big thanks to all for putting this together and all their hospitality. And special thanks to Sorocaba Zoo for their sponsorship and to WAZA for the grant that funded the course. 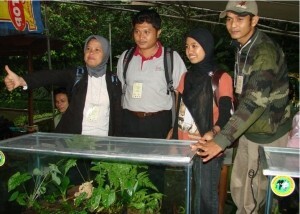 In coordination with the Zoo Negara in Kuala Lumpur, Amphibian Ark conducted an Amphibian Husbandry Workshop from June 19-22, 2009 on site at the Zoo. This was planned as a follow up to the husbandry workshop held in January 2008. Over twenty students from Malaysia, Hong Kong, Singapore, and Sabah attended the course which covered many topics including Introductions to amphibian decline issues, basic husbandry and management, Water quality, Light, Horticulture, Health and Nutrition, Medicine and Diseases and more. The course was held on grounds at Zoo Negara, coordinated so well by Felix Michael and his staff at the Zoo. The lectures were supplemented with hands on practical workshops. 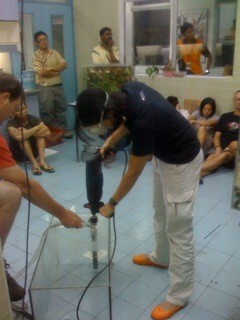 These activities were held in the veterinary clinic area where students learned techniques from setting up enclosures to veterinary care. The students, coming from diverse backgrounds in the zoo, academia and government areas, came away with an expanded knowledge of keeping amphibians in captivity. The course was instructed by Amphibian Ark Training Officer Ron Gagliardo and Brad Wilson, DVM, an Atlanta veterinarian specializing in amphibian medicine and husbandry. A three-day course on frog husbandry specifically aimed at zoo staff intending to become involved in ex situ frog conservation programs was run at Taronga Zoo in August. During the Year of the Frog, there has been increasing awareness that more Australian zoos need to become rapidly involved in amphibian conservation activities. The course presented a series of lectures, discussions and practical workshops that were designed to fast-track zoo staff with little or no amphibian keeping experience to a level where they can confidently maintain and breed many species of frog. The course was taught by three staff from the Herpetofauna Division of Taronga Zoo, two Taronga veterinarians, Amphibian Ark’s Kevin Johnson and Queensland frog biologist Ed Meyer. 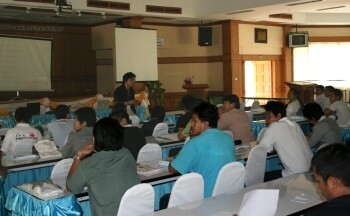 Topics covered in the course included frog and tadpole husbandry, feeding and diets, ex situ management, current regional frog conservation programs, sexing and identification, reproduction and breeding techniques, water quality and filtration, disease and quarantine, veterinary aspects of captive husbandry, public education and interpretation and captive population management. Each of the lecture topics were chosen in order to provide participants with a diverse knowledge base on amphibians and their husbandry. It is anticipated that armed with this knowledge, participants will be able to successfully establish, maintain and breed amphibian species at their institutions. In addition to the lectures listed above, short practical sessions were run including water quality testing and glass drilling demonstrations, in addition to a tour of the amphibian facilities at the host zoo. There was a broad range of participants at the course with varied experience. These included four prominent Thai herpetologists from museums and universities, ten zoo veterinarians, two prominent exotic pet veterinarians, two aquarium veterinarians, three professional amphibian dealers, twenty zoo keepers from five Thai zoos, two aquarium keepers, two fisheries department officials and three members of an amateur herpetology group. All participants were enthusiastic about their involvement in amphibian conservation activities. The broad range of participants at the course also permitted an excellent avenue for networking which will certainly be benefited from in coming months. 6th AZA Amphibian Biology & Management Course, Toledo, Ohio, USA, April 12-18, 2008. 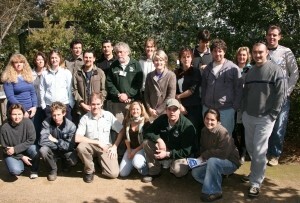 In April 2008, the AZA Amphibian Biology & Management Course was held at the Toledo Zoo in Ohio, USA. This marks the 6th offering of the course since 2004 with over 130 students having been trained to date in amphibian biology, husbandry, and conservation. The course includes a series of lectures and workshops on a diversity of subjects from the academic (classification, evolution, anatomy, water chemistry, research) to the applied (enclosure construction, assisted reproductive techniques, nutrition, medicine, conservation, telemetry). Thanks to the Toledo Zoo for hosting the course, and to those organizations that sent instructors: Amphibian Ark, Atlanta Botanical Garden, Bronx Zoo, D.J. Case & Associates, Indiana University, San Diego Zoo, Toledo Zoo, and Zoo Atlanta. The AZA course is part of a globally coordinated effort to stem amphibian extinctions, which are occurring at an unprecedented rate. There are 2000-3000 threatened amphibian species currently going extinct at the rate of ~10/year, and ~500 of them require ex situ intervention. The best case scenario is that the global zoo community currently has resources for sustainable management of 50 species, an inadequate 10% of those taxa in need. But through efforts like ABM, we are helping to build capacity here in the US and in other areas of need throughout the world. This spring’s course included seven international students bringing our total to date to seventeen [Australia, Belgium, Colombia, China, Ecuador (3), Guatemala, Mexico (3), Panama (3), Peru, and Tanzania (2)]. Thanks to the sponsors of these students: AZA, Brookfield Zoo, Cleveland Zoo, Columbus Zoo, St. Louis Zoo, ZCOG, Zoos Victoria, and Zurich Zoo. With the help of AArk, several of the international students have gone home to organize similar courses of their own, including a course at PUCE in Ecuador, at Africam Safari in Mexico, and at Cali Zoo in Colombia (which spawned a course at Valencia Aquarium in Venezuela). Thanks to the sponsors of these international courses: Brookfield Zoo, Chester Zoo, Conservation International, SeaWorld, Toledo Zoo, WAZA, ZCOG and Zurich Zoo. Plans for additional courses in the near future include Brazil, China, Costa Rica, and Peru. Course topics included: Amphibian Overview; Evolution; Classification and Diversity; Anatomy and Physiology; Husbandry; Utilizing Science in Husbandry; Water Quality; Enclosure Workshop; Life Cycle; Reproduction; Records and ID Systems; Nutrition; Medical Overview; Transport; Conservation Education. Amphibian Conservation Husbandry (ACH) is a twelve-day course designed by Durrell Wildlife Conservation Trust and Chester Zoo staff for keepers and animal managers concerned with amphibian conservation. The aim is to expose participants to the latest theory and practice of amphibian conservation husbandry and equip them with the skills necessary to manage their own populations to the highest standards. This first iteration is designed to also equip participants with the skills and material to be able to run further training courses/seminars on their return home. During January 2008, Zoo Negara in Kuala Lumpur, Malaysia, hosted an amphibian conservation workshop organised in collaboration with Amphibian Ark. The aim of this workshop was to initiate the ex situ conservation process for South-East Asian amphibians and to build local capacity to plan and maintain amphibian conservation breeding programs. In order to do this effectively, the workshop was split into two halves: (1) Species prioritization and (2) Ex situ Management. The species prioritization workshop was facilitated by Kevin Johnson (Amphibian Ark), assisted with the expertise of Graeme Gillespie (Zoos Victoria) and local experts, whilst the ex situ management was facilitated by Michael McFadden (Taronga Zoo), with the assistance of Simone Vitali (Perth Zoo). Overall, the workshop brought together about fifty researchers and zoo staff from eight countries. Amphibian Ark’s Kevin Zippel helped to coordinate and teach at the fourth Latin American husbandry workshop in Venezuela for eighty participants. Thanks to AVZA and ALPZA (particularly Diana Sarmiento, AArk Steering Committee) for helping to coordinate the workshop, Valencia Aquarium staff for hosting, the institutions that sent instructors from afar (Durrell, Africam Safari, Cali, ALPZA), and thanks to WAZA and SeaWorld for funding! Eighty people attended the course from different organizations such as universities, zoos and NGOs. National and international lecturers were sharing with the participants during the five days, finishing with a field trip in the National Park Henri Pittier. Important topics for amphibian conservation were discussed, included initiatives for the International Year of the Frog Campaign.